I’m probably going to regret this post tomorrow so I apologize in advance if you find the image unsavory. It’s just that I was so tired tonight all I wanted to do was curl up with a good book and a big bowl of popcorn. To avoid the carb overload and squeeze in a little fun after a long work day, I tried to inspire myself to draw a bit. Looking for a subject, I wandered through the house and saw my shiny, excellent Toto toilet. I highly value competence, good design, and well-made tools (from cars to combs, to clocks to computers–anything that helps manage my daily life I consider a tool). My Toto toilet is a terrific tool. It never has the problems my other WC does (which requires keeping a plunger nearby it at all times). Just writing this list makes me realize how lucky I am and how much I have to be grateful for, and this is just in the tools department, not the really important stuff of life, like friends, family and health. That’s the great thing about drawing. I start out grumpy and tired and end up feeling grateful. So maybe I won’t regret this post after all. One last thing: why is grateful spelled “grate” and not “great?” Grate is what you do with cheese or carrots. Great means good. Full of great makes more sense than full of grate. Grate in grateful comes from the Latin, grātus, which means pleasing. Grate (framework of metal bars) comes from L crāt- (s. of crātis) which means wickerwork, hurdle or crate. Grate (as in grating cheese or grating on your nerves) originally comes from German, kratzen to scratch. GREAT comes from Groat, which was a silver coin of England, equal to four pennies, issued from 1279 to 1662 and which was larger than other coins in former use. Oh the poor English learners! What a complex melting pot the English language is! Great model for drawing! I just had new Totos installed–LOVE the GMax flush of the Drake Toto. Wow, like Moleskine fans, we could have a whole site dedicated to Toto fans. Jana!! I JUST LOVE your meanderings — and your ‘grateful/gratefulf’ list!!! I love the way your mind works nd the candid, fun way you share it with us in words and sketches!!! Super job on the toto — a difficult perspective to be sure…. I am ever grateful for you! It was a lot harder than I thought it would be, especially because I have such a small bathroom, and I was sitting on the edge of the tub and my knees kept getting in the way of seeing the toilet. Gratify would be in that lexicon camp, too. That toilet (dare I say it?) looks very welcoming. I couldn’t live without photoshop, caller ID or a bed either. What an inspiring post, Jana! Aren’t we lucky to be able to turn cravings for carbohydrates into productive sketches? Hmm, it doesn’t work every time, but it definitely helps. Thanks for looking up grateful for us all – I probably never would have. Love this Jana…Grate that we do things on impulse and regret greatefully later, so that way we have the gratest fun! Grate sketch and other pre sleep wanderings! 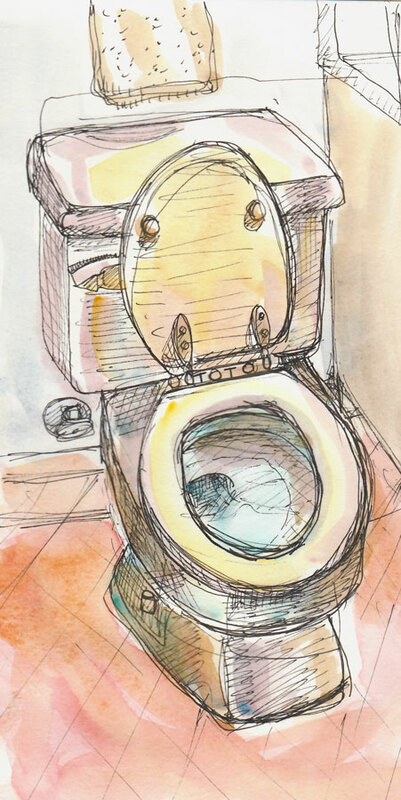 My son, who lives in Tokyo, says that Totos are so ubiquitous that people say they have to go to the Toto, instead of the generic toilet – much like we use Kleenex for tissue. I never would have thought of drawing it, but I love my Toto too. Seeing the colors you used made me look again at my john to try to see it as not just white! And I love the different defs of the grate/great question. Amazing that the 3 definitions of grate came from 3 different root words all ending up being pronounced the same way in English! Now to tackle why great is pronounced with a long a sound instead of any of e as in meat or e as in head? Jana, this just made me laugh out loud. It’s so amusing to see what kind of objects you always choose for a quick sketch – I assume nothing indeed is safe from you. I find this absolutely adorable 😀 😀 😀 and each time I click to your blog I wonder for myself what you might have chosen next. I am GRATEFUL for this blog! Jana, you are truly inspirational! From helpful advice to ladies on peeing behind trees, to wonderful sketches of you in emergency-plumber-mode, to hilarious illustrated dreams, you bring welcome sunshine. Excellent post, Jana! 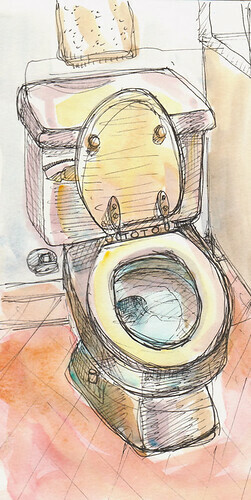 In fact, more of us should sketch our toilets with gratitude! a picture of the toilet…nice! It IS important not to take these things for granted! Oh, Jana, this post lifts my spirits! And a competent toilet seems like a perfect subject for painting—why not? It’s very Jana-eque, at any rate ;D.
Caller ID! My favorite invention of recent memory! thanks Jana ! its really an inspiring post thanks.